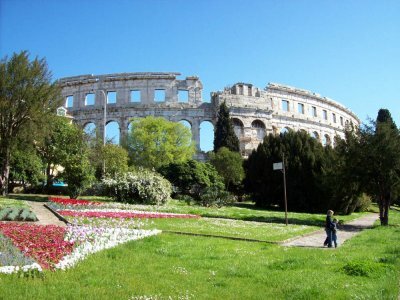 It is located at the most representative site in town, a gentle slope at the foot of the classical beauty – Arena. 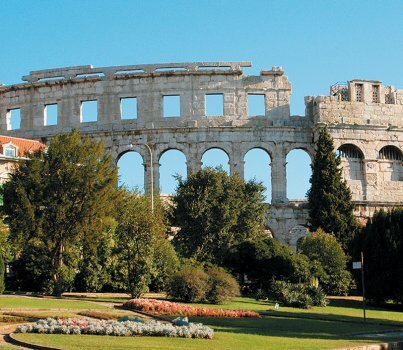 Nearly always being named the most beautiful park in Pula, it is one of the few designed parks from the period of the Italian rule that maintained its unchanged shape in terms of surface, shape, size of lot and paths. The park was designed in the 1930s at the site of the previous military warehouse originally erected for the needs of the Austro-Hungarian and afterwards the Italian army. In 1935 the Italian administration erected a grand monument of Emperor Augustus in the middle of the lower edge of the park, that was as in the previous Valeria’s Park (Park Valerija) taken away in 1947 after the departure of the Italian administration. At that site a new lot was erected that later became an integral part of the park planted and maintained in the Italian style. Species like yew, privet and box, as well as a magnitude of flowering annuals gave this park, and are still giving it, a peculiar charm. The area of 3,300m2 is dominated by a lively floral carpet of annuals that are planted anew each year. 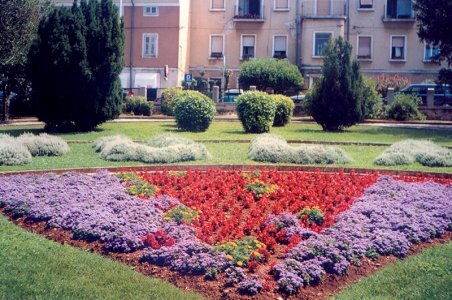 Visitors often take photographs here wishing to seal their stay in the ancient city beside the blossoming carpet of pansies, begonias, petunias with the amphitheater in the background. The park was maintained in the old manner until the 1950s meaning that plants in the park were let to grow freely. New species in fashion at the time were also planted. Various floral shrubs such as tobira, holly and even spruce were planted. Apart from yew, holly too, is a protected species in Croatia and its fine red berries add to the beauty and value of the park. Emperor Augustus’ Park has for decades been a valuable exhibit testifying to the park culture of the city. If you climb the steps atop the amphitheater, you will recognize the inscription “Pula” made of lavender shrubs at the central lot in the Park. Lavender (Lavandula officinalis) is a very common perennial in the coastal part of Croatia and has recently become very popular in landscape gardening. It is very often planted around homes because of its beautiful lilac flowers in the summer months, and also for its characteristic scent. The plant abounds in essential oil of a very wide application: it harmonizes the body, and is successfully used in treating mental illness, insomnia, depression and stress. When rubbed into the skin, it is a very efficient mosquito repellent.